Have you been left in the cold by Google's Notebook service closure? Well, that's too bad, but there is hope - two information management services are inviting estranged Notebook users to become friends. 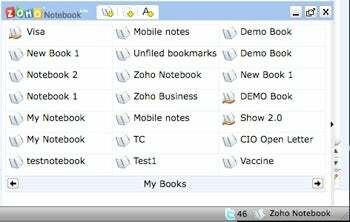 Battling it out for your attention, I present you Zoho Notebook and Evernote. Capitalizing on Google's Notebook service closure announcement earlier this month, Zoho Notebook and Evernote have refreshed their services and also launched plugins to help you import your Google Notebook data. And if you're still undecided which service of the two to use, read on for an outline of what's what. Besides the features you were enjoying on Google Notebook, Zoho updated its web app with some other useful features such as linking between notebooks and audio and video recording. And if you're using the whole Zoho suite, Zoho Notebook also integrates the company's chat application. Read PC World's review of Zoho Notebook. Now, when it comes to actually importing your Google Notebook data, the process is quite simple. All you have to do is install a plugin for your browser, login to Zoho and Google Notebook and click an URL (full details here). Unfortunately, you will have to use Firefox for this mission, as Zoho's plugin is only available for Mozilla based browsers. Evernote lets you capture information from any environment (mobile, web, desktop), clipping together all the data and making it available on your laptop, desktop (both Mac and PC) and on your mobile (iPhone/iPod Touch and Windows Mobile). Basically, Evernote is Google Notebook on steroids but with a different twist, offering dedicated software for various platforms. Importing your Google Notebook data with Evernote is not complicated either. You just export the files via Google Notebook's dedicated feature and then go Evernote's website and import it (full details here). On the downside, this function cannot be automated, and you will have to export from Google and import into Evernote all of your notebooks individually. Choosing a replacement service for Google's Notebook depends mainly on your everyday needs. Besides Zoho Notebook and Evernote, Google also points out that you can replace most of Notebook's features with other Google Services such as Docs for writing note, Gmail Tasks for to-do lists and Bookmarks for saving your favorite web destinations. How is your Google Notebook transition going? Please let me know in the comments.